I saw this technique being used by Laurel Beard and Julie Ebersole. So I thought I will give this technique a try. The Butterflies die from the new release Penny Black was perfect for this technique. I also had this stained glass look which I wanted to achieve. Here is the Butterflies die from Penny Black. And here is my card using the die. I die cut the butterflies die using black cardstock, then adhered the die on an adhesive sheet. I poured and burnished white fine glitter in the negative space. Dusted off the excess. Now I coloured the glitter with alcohol markers. Julie and Laurel used copics to colour. I am afraid to use Copic markers. 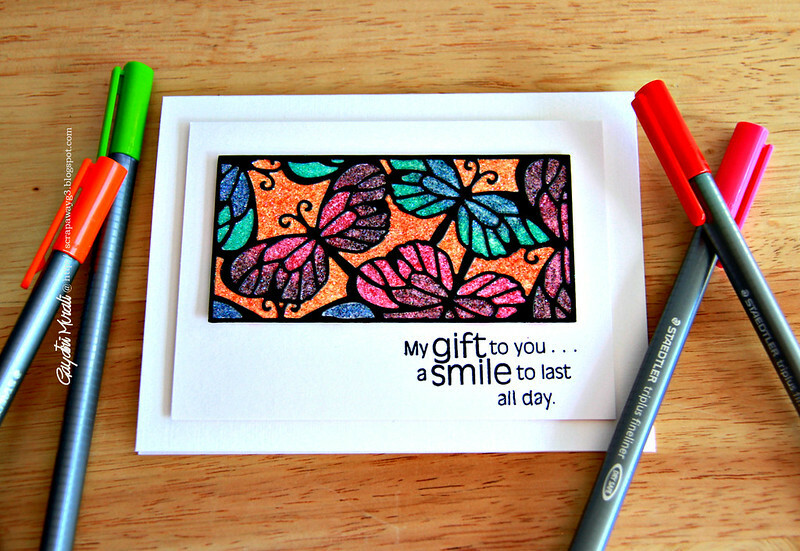 I finally have a good collection and I did not want to ruin the markers.So I used Stampin’ Up alcohol markers instead. The markers are still good to use and the colours turned out lovely. I then removed the adhesive sheeting and adhered the coloured butterflies die to white cardstock. Trimmed the excess, I wanted this to be the highlight of my card, so I kept everything else simple. 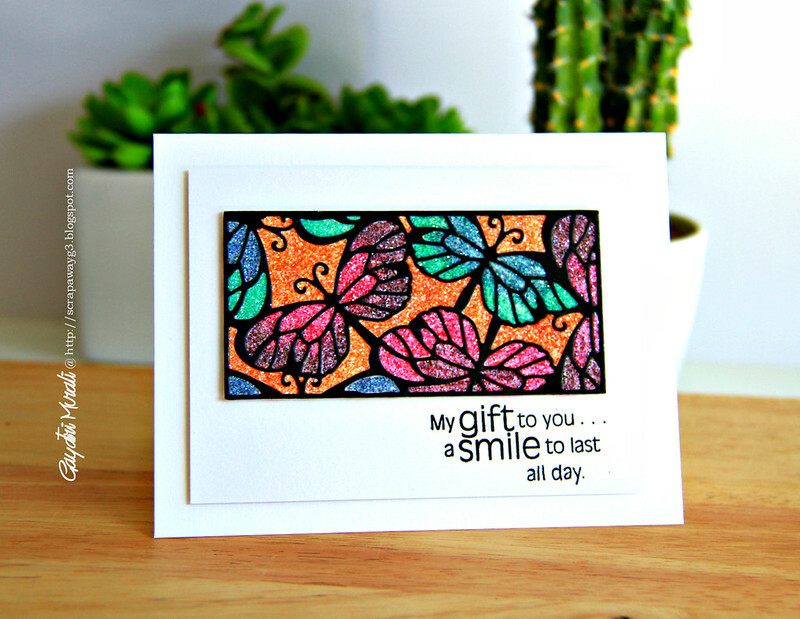 The sentiment is from Smile All Day stamp set also from Penny Black newly released. 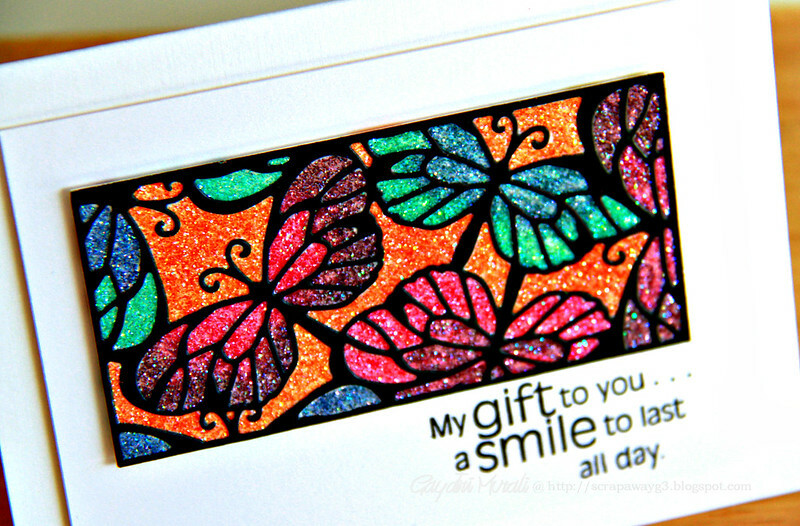 Love love the colours, glitter and gives the stained glass look. Thanks Laurel and Julie for sharing this fun technique. WOW! This turned out stunningly beautiful. I've tried this technique before but never got such and amazing result. Amazing card!! The glitter and colors look stunning!! Wow, Gayatri, this is simply stunning!! Wow i love stainglass and this is so stunning! Absolutely brilliant! Love this, Gayatri! Wow it looks so bright and beautiful Gayatri! Gorgeous! I didn't know SU had alcohol markers! Good to know!